Sunday April 10th, while sitting up in her hospital bed reading her book and nibbling on a tasty cookie, Audrey decided that was enough and left the stage. She leaves to mourn her daughters Bonnie and Dianne (Gary) and her son Robin (Bev), her grandchildren Robert, Sarah, Cindy, Julie Anne, Melanie, Jamee, Shawn, Jason and Amanda and 13 great grand children. She was predeceased by her son Mike, her baby girl Kathyrn, her husband Bud, and her only sister Nita Spac of England. 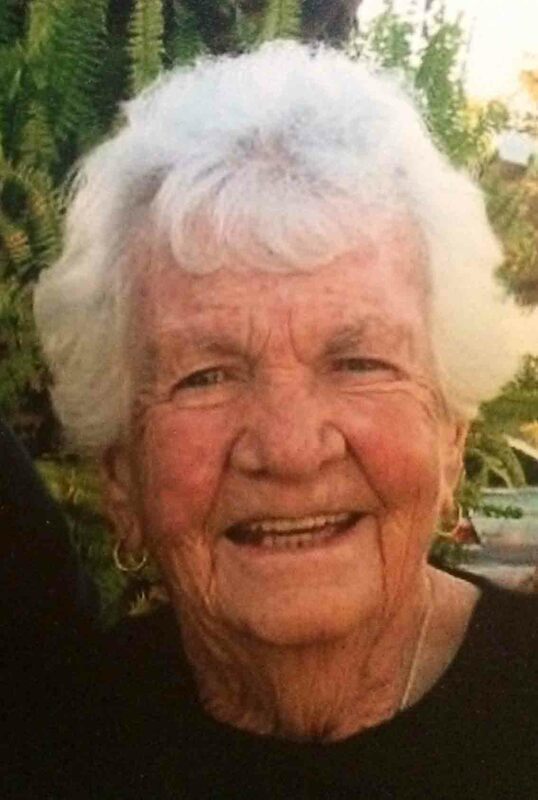 She was like a second mother to many of her nieces and will be greatly missed by all of them and her nephew, and her friend and sister-in-law Betty Shotton. She will be sadly missed by her dear friend Peter Baker and her Florida family of friends. At 9O Audrey has had a full and adventurous life. After raising 3 children and at the same time as raising the 4th Audrey went into the Antique business where she made many lifetime friends and had a wonderful almost 30 year career of shops, shows and great finds. Audrey loved to cook. She was famous for her prize winning apple pies and most of all her Butter Tarts! Whether it was Robin's favourite spaghetti, butter tarts for Dad, Dianne and friends, Nanaimo bars for Bonnie, cookies for the grandchildren, dog biscuits for the four-footed friends, or dinner for 200 people, her heart was in all her food! She answered to many names… Audrey, Honey, Mom, Nanny, Mrs Seale…. and all who know her will miss her. We could all learn from her how to live life! We will miss Aunt Audrey and her love of life. Our thoughts are with you all. Many wonderful times will be remembered. remembered over a sip of wine and an open fire down by the river. Audrey had a larger-than-life personality. She was light-hearted and laughed easily and frequently. I first met “Mrs. Seale” when I was 13 years old. Dianne and I had become best friends and throughout our teens I spent at least two weekends a month at Dianne’s. Audrey was always warm and welcoming, open and friendly. I cherish and appreciate those many memories. Our sympathy to all of Audrey’s family. Whats an amazing woman you were Mrs.Seale! Your smile was contagious and your personality was beautiful. There needs to be more people in this world like Audrey Seale. Thinking of you and your family , your ” slacker ” / nurse Tracy. The fondest memories of my years in Canada are of travelling to, from, and setting up at antique shows with Audrey and Bud throughout the 1970’s and early 80’s, before they moved to Florida and I moved to California. I considered them my second family. I remember the house in Hemmingford where we often stayed, the laughter, Audrey’s adventuresome spirit and in equal measure her consistently wise counsel. I treasure the memories and they will continue to live in my heart. My love and condolences to you all. Liz. My condolences to the family. I knew Nanna as she was known to Julie Anne when we were young children. I remember Nanna and Bud driving up from Florida in their big Licoln Town Car. Nanna and Bud were always so nice. May fond memories bring you joy and peace in your time of sorrow. I was so sorry to hear of Audrey’s passing last Sunday, She left as she was, it seems, quietly and without any fuss. I didn’t know her very well, but she was always so welcoming when Rae and I came for the famous Seale family reunions, and yes, she could cook so well. I am grateful that Bud was in touch all those years ago and that our families connected once more. I feel privileged to have known Bud and Audrey and all of you. John and I will always remember Aunt Audrey at her birthday party last summer, teaching us all how to line dance and gamely wearing the tiara I gave her. She was always the life of the party! She will be sorely missed , but we will treasure our memories of her. You could always count on Audrey to light up a room with her personality, sense of humour and ability to tell it like it is. Meeting in the antique business some 40 years ago I became good friends with Audrey and Bud who eventually moved into the log cabin next door where our relationship grew into one of family — not only a dear friend, Audrey became a second mother to me and we went through many of life’s trials and tribulations together. I look over there today and I see her reading, cooking, and having that five o’clock glass of wine! The last thing we talked about was her getting out of the hospital and joining Susan and I and friend Fred at the local pub — we will raise a glass. All our love and sympathies to Dianne, Robin and Bonnie and all the grandchildren who are very close to our hearts. Our condolences to all the Seale family. Specially Bonnie and Dianne and families. She will be missed….. RIP Audrey. My deepest and heart felt sympanthy for the family. God bless you all.